For Hallowe'en my 7-year-old daughter wanted to be a My Little Pony character from the new TV series. She loves shiny things and the color purple, so it was no surprise that she chose Rarity. 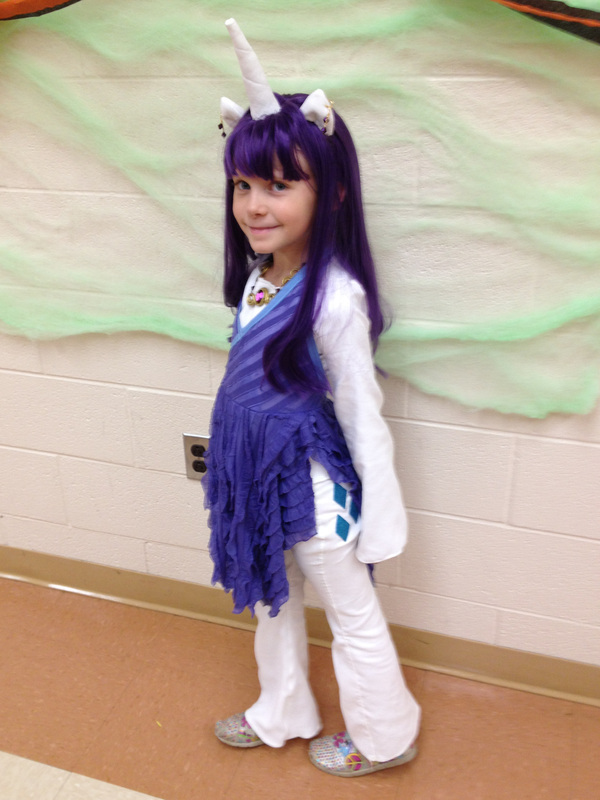 Rather than try to make a cumbersome horse costume, we decided to make a costume of Rarity as a little girl. I ordered a really long purple wig online and chopped the bottom half off to make a tail with. Then sewed ears and a horn onto the top part of the wig. Of course, Rarity needs accessories. So we added pony earrings and a necklace loosely based on her Elements of Harmony necklace. We started with a soft, velvety white fabric and made her some flared pants and a shirt for a base. Complete with cutie-mark and tail! Then sewed her a rarity-style dress to wear to the school Hallowe'en dance party.